Spectral Type: G2 V Luminosity: 3.83 x 10 33 ergs/sec. The Sun is a medium size star known as a yellow dwarf. The Sun is just one of about 100 billion stars in our galaxy, The Milky Way. 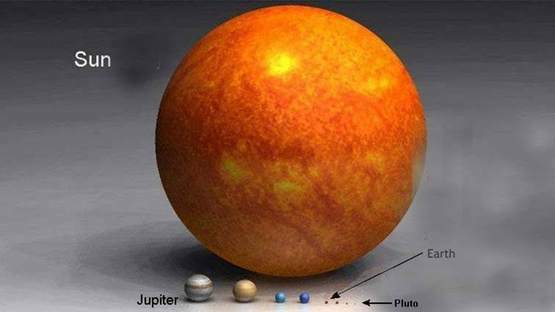 The Sun is by far the largest object in the solar system. 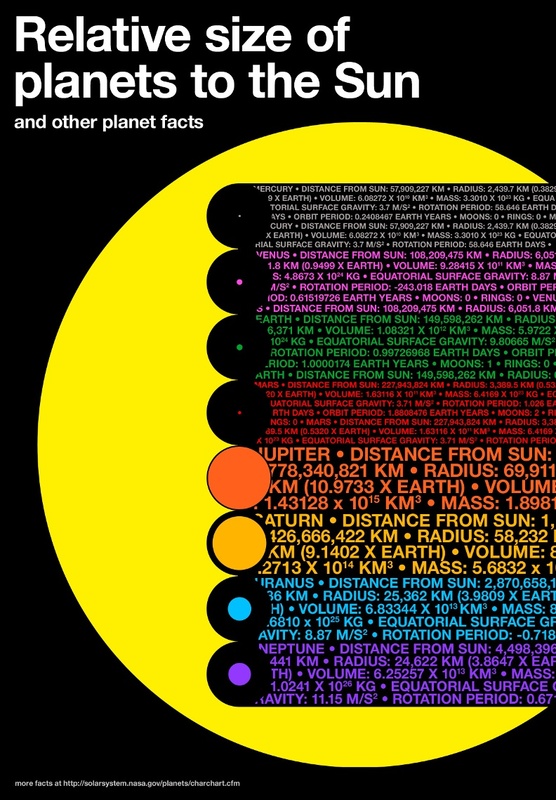 It contains more than 99.8% of the total mass of the Solar System . The Sun is about 93 million miles away from the Earth. The distance from the Earth to the Sun varies throughout the year. At its closest, the Sun is 91.1 million miles from Earth. 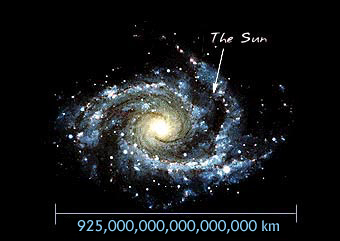 At its farthest the distance between the Sun and the Earth is 94.2 million miles. It takes light 8 min. 20 sec to travel from the sun to the Earth. The Sun is about 4.5 billion years old. It will continue to radiate for another 5 billion years. It will start to run out of core hydrogen in *less* than 4 billion years from now, and will be expanding into a red giant from that point on. In fact, the energy output of the sun will increase prior to the red giant phase to a point where the Earth will probably become too hot to support life in only 1 or 2 billion years. When the sun does reach the red giant phase, the core will finally become hot enough for helium fusion to occur (the "Helium flash", followed by core Helium fusion and continued Hydrogen fusion in a shell around the growing Helium core). After this Helium in the core is exhausted, the sun will then collapse into a white dwarf. "Erde" means Earth, "Sonne" is "the Sun"
A light-year is a unit of length used by astronomers to measure interstellar distance (the distance between stars). 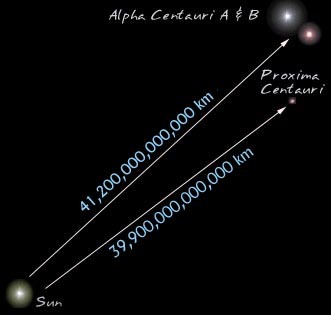 A light-year is defined as the distance that light will travel in a year. The speed of light is 186,000 miles per second (300,000 km per second). The Sun is personified in many cultures: the Greeks called it Helios, the Egyptians principal god was Ra the sun god and the Romans called it Sol. 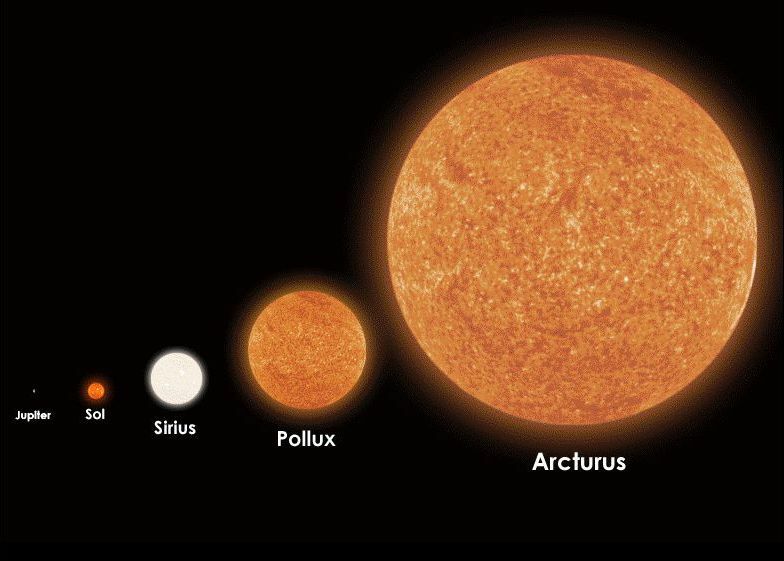 The Sun is an average star, similar to millions of others in the Universe. It is classified as a yellow dwarf of spectral class G2. Even a relatively quiet day on the Sun is busy. This ultraviolet image shows bright, glowing arcs of gas flowing around the sunspots. It is a prodigious energy machine, manufacturing about 4.0E023 kilowatts of energy per second. In other words, if the total output of the Sun was gathered for one second it would provide the U.S. with enough energy, at its current usage rate, for the next 9,000,000 years. The basic energy source for the Sun is nuclear fusion, which uses the high temperatures and densities within the core to fuse hydrogen, creating energy and producing helium as a by-product. The core is so dense and the size of the Sun so great that energy released at the center of the Sun takes about 50,000,000 years to make its way to the surface, undergoing countless absorptions and reemissions in the process. The Sun's visible surface, called the photosphere, has a temperature of 5,700 C(10,900 Degrees F). The gases heat up and become more compressed at deeper levels, until the temperature reaches 15 million C( 27 Million Degrees F) deep within the Sun's energy producing core (If the Sun were to stop producing energy today, it would take 50,000,000 years for the effects to be felt at Earth! The center of the sun is very hot (about 15 million degrees Celsius) and the pressure is immense (about 100 billion times the airpressure here on Earth). Because of that, atoms come so close to each other that they fuse. In every second, the Sun spends 700 billion tons of protons (or: Hydrogen) in this way. And only a small fraction (0.7 percent) is turned into light. Right now, about half of the amount of Hydrogen in the core of the Sun has been fused into Helium. The Sun, can be divided into six layers. 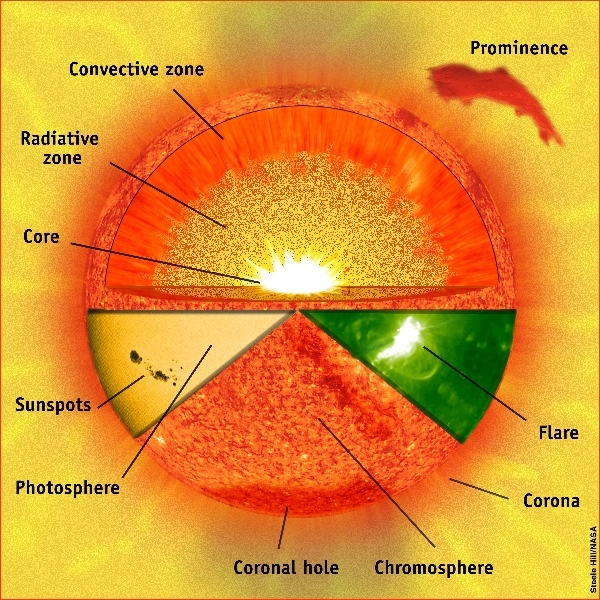 From the center out, the layers of the Sun are as follows: the solar interior composed of the core (which occupies the innermost quarter or so of the Sun's radius), the radiative zone, and the the convective zone, then there is the visible surface known as the photosphere, the chromosphere, and finally the outermost layer, the corona. The innermost layer of the sun is the core. With a density of 160 g/cm^3, 10 times that of lead, the core might be expected to be solid. However, the core's temperature of 15 million kelvins (27 million degrees Fahrenheit) keeps it in a gaseous state. In the core, fusion reactions produce energy in the form of gamma rays and neutrinos. Gamma rays are photons with high energy and high frequency. The gamma rays are absorbed and re-emitted by many atoms on their journey from the envelope to the outside of the sun. When the gamma rays leave atoms, their average energy is reduced. However, the first law of thermodynamics (which states that energy can neither be created nor be destroyed) plays a role and the number of photons increases. Each high-energy gamma ray that leaves the solar envelope will eventually become a thousand low-energy photons. The neutrinos are extremely nonreactive. To stop a typical neutrino, one would have to send it through a light-year of lead! Several experiments are being performed to measure the neutrino output from the sun. Chemicals containing elements with which neutrinos react are put in large pools in mines, and the neutrinos' passage through the pools can be measured by the rare changes they cause in the nuclei in the pools. For example, perchloroethane contains some isotopes of chlorine with 37 particles in the nucleus (17 protons, 20 neutrons). These Cl-37 molecules can take in neutrinos and become radioactive Ar-37 (18 protons, 19 neutrons). From the amount of argon present, the number of neutrinos can be calculated. 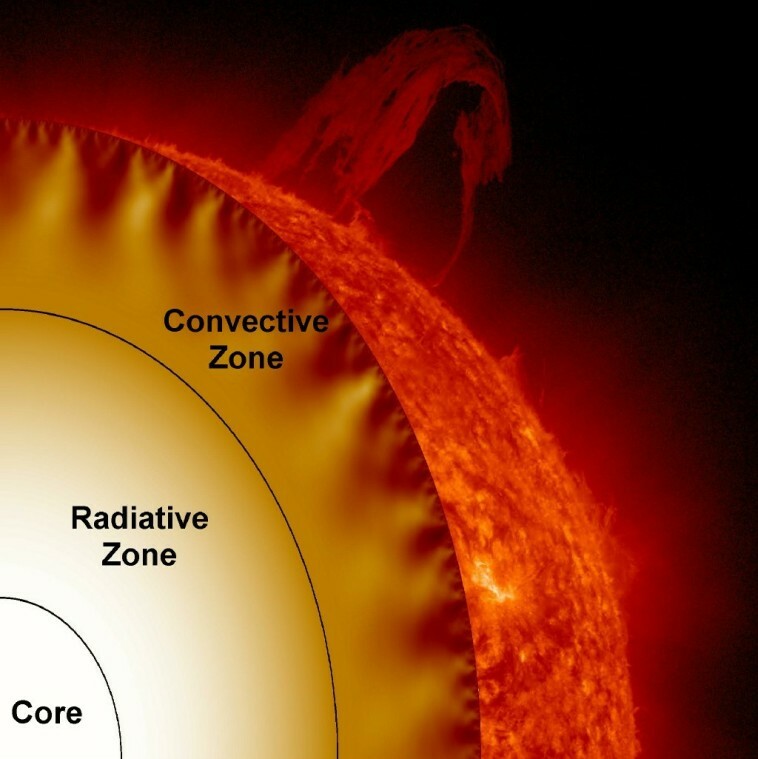 The radiative zone extends outward from the outer edge of the core to the interface layer or tachocline at the base of the convection zone (from 25% of the distance to the surface to 70% of that distance). The radiative zone is characterized by the method of energy transport - radiation. The energy generated in the core is carried by light (photons) that bounces from particle to particle through the radiative zone. Although the photons travel at the speed of light, they bounce so many times through this dense material that an individual photon takes about a million years to finally reach the interface layer. The density drops from 20 g/cm³ (about the density of gold) down to only 0.2 g/cm³ (less than the density of water) from the bottom to the top of the radiative zone. The temperature falls from 7,000,000°C to about 2,000,000°C over the same distance. The interface layer lies between the radiative zone and the convective zone. The fluid motions found in the convection zone slowly disappear from the top of this layer to its bottom where the conditions match those of the calm radiative zone. This thin layer has become more interesting in recent years as more details have been discovered about it. 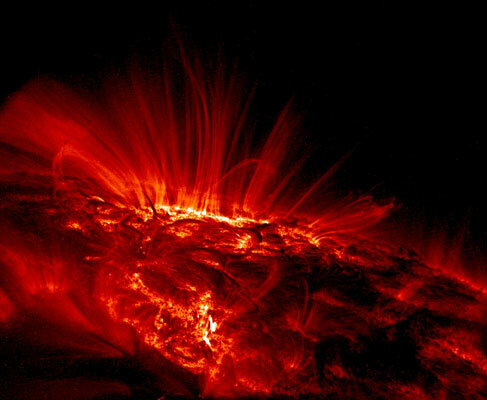 It is now believed that the Sun's magnetic field is generated by a magnetic dynamo in this layer. The changes in fluid flow velocities across the layer (shear flows) can stretch magnetic field lines of force and make them stronger. This change in flow velocity gives this layer its alternative name - the tachocline. There also appears to be sudden changes in chemical composition across this layer. The convection zone is the outer-most layer of the solar interior. It extends from a depth of about 200,000 km right up to the visible surface. At the base of the convection zone the temperature is about 2,000,000°C. This is "cool" enough for the heavier ions (such as carbon, nitrogen, oxygen, calcium, and iron) to hold onto some of their electrons. This makes the material more opaque so that it is harder for radiation to get through. This traps heat that ultimately makes the fluid unstable and it starts to "boil" or convect. Convection occurs when the temperature gradient (the rate at which the temperature falls with height or radius) gets larger than the adiabatic gradient (the rate at which the temperature would fall if a volume of material were moved higher without adding heat). Where this occurs a volume of material moved upward will be warmer than its surroundings and will continue to rise further. These convective motions carry heat quite rapidly to the surface. The fluid expands and cools as it rises. At the visible surface the temperature has dropped to 5,700°K and the density is only 0.0000002 gm/cm³ (about 1/10,000th the density of air at sea level). The convective motions themselves are visible at the surface as granules and supergranules. Outside of the core is the radiative envelope, which is surrounded by the convective envelope. The temperature is 4 million kelvins (7 million degrees F). The density of the solar envelope is much less than that of the core. 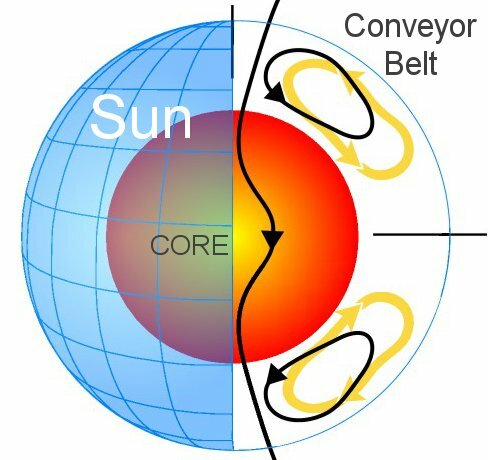 The core contains 40 percent of the sun's mass in 10 percent of the volume, while the solar envelope has 60 percent of the mass in 90 percent of the volume. The solar envelope puts pressure on the core and maintains the core's temperature. The hotter a gas is, the more transparent it is. The solar envelope is cooler and more opaque than the core. It becomes less efficient for energy to move by radiation, and heat energy starts to build up at the outside of the radiative zone. The energy begins to move by convection, in huge cells of circulating gas several hundred kilometers in diameter. Convection cells nearer to the outside are smaller than the inner cells. The top of each cell is called a granule. Seen through a telescope, granules look like tiny specks of light. Variations in the velocity of particles in granules cause slight wavelength changes in the spectra emitted by the sun. The photosphere is the zone from which the sunlight we see is emitted. The photosphere is a comparatively thin layer of low pressure gasses surrounding the envelope. It is only a few hundred kilometers thick, with a temperature of 6000 K. The composition, temperature, and pressure of the photosphere are revealed by the spectrum of sunlight. In fact, helium was discovered in 1896 by William Ramsey, when in analyzing the solar spectrum he found features that did not belong to any gas known on earth. The newly-discovered gas was named helium in honor of Helios, the mythological Greek god of the sun. In an eclipse, a red circle around the outside of the sun can sometimes can be seen. This is the chromosphere. Its red coloring is caused by the abundance of hydrogen. From the center of the sun to the chromosphere, the temperature decreases proportionally as the distance from the core increases. 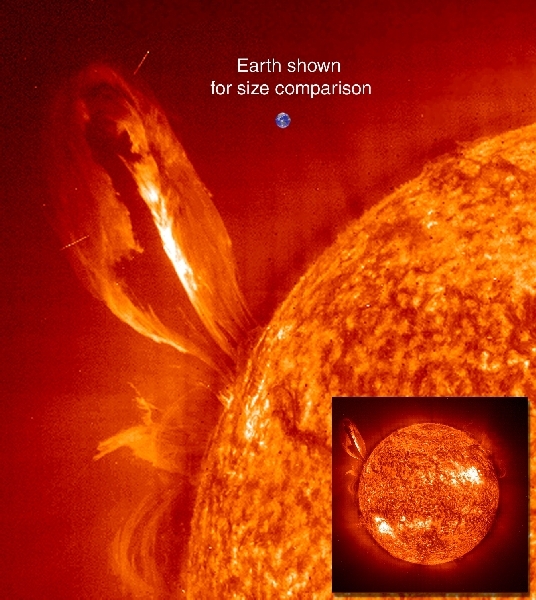 The chromosphere's temperature, however, is 7000 K, hotter than that of the photosphere. Temperatures continue to increase through the corona. The outermost layer of the sun is the corona. Only visible during eclipses, it is a low density cloud of plasma with higher transparency than the inner layers. The white corona is a million times less bright than the inner layers of the sun, but is many times larger. The corona is hotter than some of the inner layers. Its average temperature is 1 million K (2 million degrees F) but in some places it can reach 3 million K (5 million degrees F). Temperatures steadily decrease as we move farther away from the core, but after the photosphere they begin to rise again. There are several theories that explain this, but none have been proven. 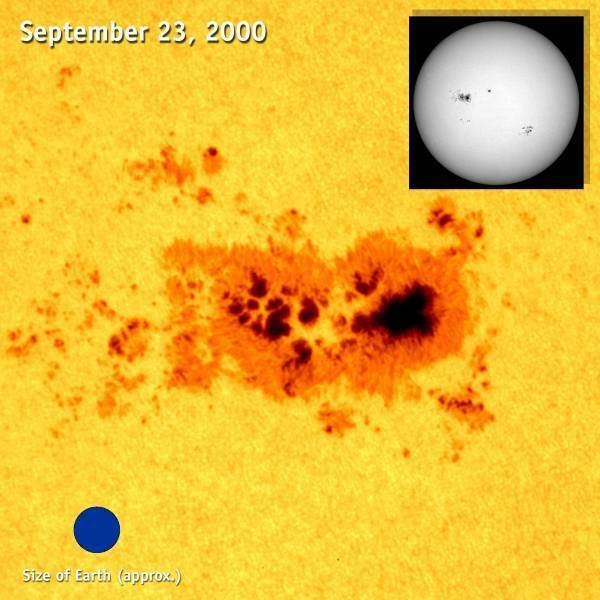 Sunspots are dark spots on the photosphere, typically with the same diameter as the Earth. They have cooler temperatures than the photosphere. The center of a spot, the umbra, looks dark gray if heavily filtered and is only 4500 K (as compared to the photosphere at 6000K). Around it is the penumbra, which looks lighter gray (if filtered). Sunspots come in cycles, increasing sharply (in numbers) and then decreasing sharply. The period of this solar cycle is about 11 years. The sun has enormous organized magnetic fields that reach from pole to pole. Loops of the magnetic field oppose convection in the convective envelope and stop the flow of energy to the surface. This results in cool spots at the surface which produce less light than the warmer areas. These cool, dark spots are the sunspots. 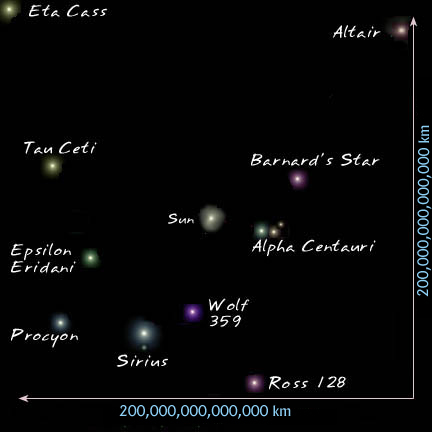 Specialized instruments, either in ground-based or space-based telescopes, however, can observe light far beyond the ranges visible to the naked eye. Different wavelengths convey information about different components of the sun's surface and atmosphere, so scientists use them to paint a full picture of our constantly changing and varying star. Yellow-green light of 5500 Angstroms, for example, generally emanates from material of about 10,000 degrees F (5700 degrees C), which represents the surface of the sun. Extreme ultraviolet light of 94 Angstroms, on the other hand, comes from atoms that are about 11 million degrees F (6,300,000 degrees C) and is a good wavelength for looking at solar flares, which can reach such high temperatures. By examining pictures of the sun in a variety of wavelengths – as is done through such telescopes as NASA's Solar Dynamics Observatory (SDO), NASA's Solar Terrestrial Relations Observatory (STEREO) and the ESA/NASA Solar and Heliospheric Observatory (SOHO) -- scientists can track how particles and heat move through the sun's atmosphere. We see the visible spectrum of light simply because the sun is made up of a hot gas – heat produces light just as it does in an incandescent light bulb. But when it comes to the shorter wavelengths, the sun sends out extreme ultraviolet light and x-rays because it is filled with many kinds of atoms, each of which give off light of a certain wavelength when they reach a certain temperature. Not only does the sun contain many different atoms – helium, hydrogen, iron, for example -- but also different kinds of each atom with different electrical charges, known as ions. Each ion can emit light at specific wavelengths when it reaches a particular temperature. Scientists have cataloged which atoms produce which wavelengths since the early 1900s, and the associations are well documented in lists that can take up hundreds of pages. Solar telescopes make use of this wavelength information in two ways. For one, certain instruments, known as spectrometers, observe many wavelengths of light simultaneously and can measure how much of each wavelength of light is present. This helps create a composite understanding of what temperature ranges are exhibited in the material around the sun. Spectrographs don't look like a typical picture, but instead are graphs that categorize the amount of each kind of light. On the other hand, instruments that produce conventional images of the sun focus exclusively on light around one particular wavelength, sometimes not one that is visible to the naked eye. 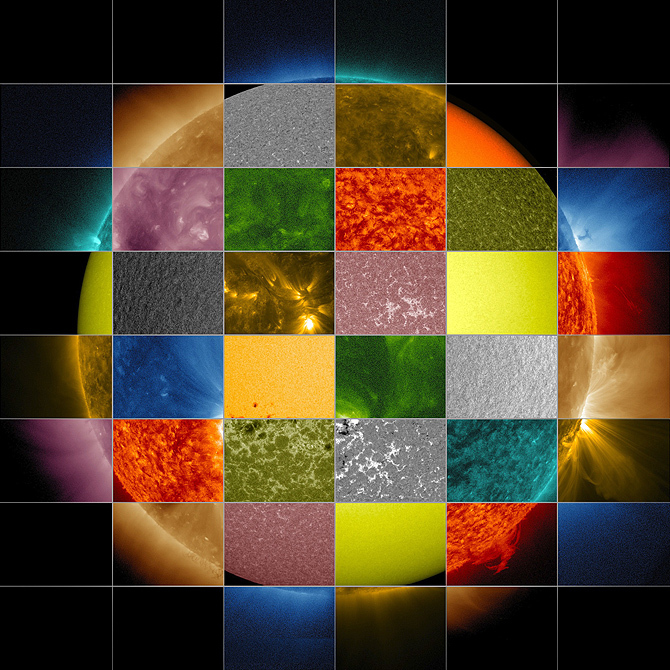 SDO scientists, for example, chose 10 different wavelengths to observe for its Atmospheric Imaging Assembly (AIA) instrument. Each wavelength is largely based on a single, or perhaps two types of ions – though slightly longer and shorter wavelengths produced by other ions are also invariably part of the picture. Each wavelength was chosen to highlight a particular part of the sun's atmosphere. 4500: Showing the sun's surface or photosphere. 1700: Shows surface of the sun, as well as a layer of the sun's atmosphere called the chromosphere, which lies just above the photosphere and is where the temperature begins rising. 1600: Shows a mixture between the upper photosphere and what's called the transition region, a region between the chromosphere and the upper most layer of the sun's atmosphere called the corona. The transition region is where the temperature rapidly rises. 304: This light is emitted from the chromosphere and transition region. 171: This wavelength shows the sun's atmosphere, or corona, when it's quiet. It also shows giant magnetic arcs known as coronal loops. 193: Shows a slightly hotter region of the corona, and also the much hotter material of a solar flare. 211: This wavelength shows hotter, magnetically active regions in the sun's corona. 335: This wavelength also shows hotter, magnetically active regions in the corona. 94: This highlights regions of the corona during a solar flare. 131: The hottest material in a flare.